A woman from the western suburbs of Chicago won a $2 million instant lottery prize when she followed her hunch and picked an instant ticket from a bin marked ’10’. She considers the number lucky as it had adorned her old basketball and softball uniforms. 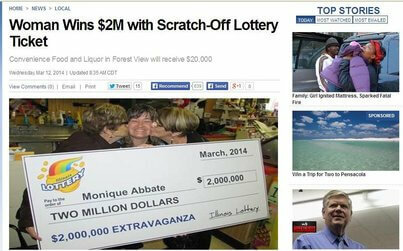 When Monique Abbate scratched the “$2,000,000 EXTRAVAGANZA!” ticket she purchased from the Convenience Food and Liquor, it revealed that she had won the top prize. She then went home to record the reactions of her mother and grandmother. The school administrator can hardly believe the blessings that have come her way. Now she can pay off the student loans that financed a bachelor’s and two master’s degrees. A west suburban woman officially accepted her $2 million lottery prize Tuesday after using her old sports jersey number to choose the winning scratch-off ticket. She’s also planning a trip to Vegas with family and friends. Here’s hoping she doesn’t blow it all away in the sin city.